There is movement in the marine market. That's the view from Irish boat dealers at this week's Southampton Boat Show who, after a torrid few seasons, are finding there's a pick up in boat sales but only when the price is right. In 2007 there were 70 Irish yacht and boat sales staff manning stands in Southampton, this week that figure was down by about 60%. No one needs reminding of recession and the drop off in boat sales has been a reflection of the hard times. Confidence is returning to the market in spite of the dire warnings about currency crises and dealers are now beginning to take trade ins again but they're still cautious as they have little room for error. The good news though for boat owners is that there is now some great value in the market and the Southampton Boat show is an example of that. A core of about 15 Irish dealers are doing business there, thanks in no small part to the availability of marine finance again. Interestingly, finance deals for values over €500,000 are 'brisk' but they remain sluggish for amounts under that, according to Afloat.ie's source. That's surprising with the value of new craft on offer, such as a 2011 Beneteau Oceanis 48 footer at €209,000. A decade ago a boat with half that kit and of similar size would have been priced well over IR£350k. 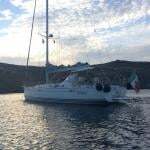 BJ Marine currently have three interested Irish parties in the 48 footer this week. In essence dealers say that if you're prepared to drop your price on your trade in then you can probably make it back on a new purchase. But just how much do asking prices need to drop? The amount varies between boat types but recently James Kirwan of BJ Marine sold a Beneteau Oceanis 39.3 for approximately €80k. An Oceanis 411 of the same vintage went for roughly €90k. 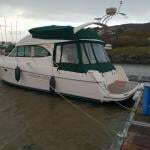 Alan Barton of MGM Boats in Kinsale sold a 2008 Jeanneau Sun Odyssey 39i recently for 125k. Two examples of nearly new Jeanneau Merry Fisher motorboats, a popular flybridge model in Ireland, fetched 75k and 85k approximately. Ironically, boat dealers have even been able to make progress through these bad times. Boats have not been as badly affected by the recession as other 'toys'. ' Unlike cars or property a boat is neither left hand drive or rooted to a particular spot making them easier to relocate and dispose of without resorting to fire sale prices' says BJ Marine's Bernard Gallagher. In fact the worse the news grew about Ireland, the more business Irish dealers were able to do did as international buyers took advantage of the siutation to bag a bargain. The trend is confirmed in part by the amount of search traffic coming from Scandinavia on leading Irish Boats for Sale sites such as Afloat.ie. Swedish buyers are buying boats from 15k to 500k but most interest from Sweden is in five year old yachts in the 30-40 foot category. In terms of asset types, the old adage that if you want to make money buy a house, lose money buy a car or keep money buy a boat does not quite ring true thanks to the property crash but there's still some truth in it for boats. 'Over the last seven years I bought two apartments, a load of shares and the boat. The apartments are under water, the shares are gone but the boat's still worth something' that's what one rueful Irish boat owner told Afloat.ie yesterday. The advent of boats for sale websites is allowing Europeans a European wide selection to choose from and Ireland has been the focus because of the good value. Such has been the exodus of used boats from Ireland to overseas markets that Gallagher says there is a dearth of quality used large craft for sale in Ireland now. The Southampton boat Show continues until Sunday but be warned the cost of flights from Dublin directly to Southampton for a day return this weekend are running at over €300!